Mensusa https://www.mensusa.com/articles/look-great-in-theme-party-blazers-men-by-making-the-right-choice.html Look Great In Theme Party Blazers Men By Making The Right Choice Sometimes you need to dress according to the themes set by the organizers of the party. In that case, your theme party blazer men should be well fitted and of the right shade like the blue velvet blazer, burgundy blazer and other shades that will portray your personality. When you need to attend a party that has a specific theme, you have to dress up accordingly. The best place to buy all types of theme party blazers men is MensUSA that spreads out an array of colorful blazers that suit every theme party. It is your duty to pick out the right size and cuts that enhance your stature and your looks. Blazers are made of a variety of fabrics. But a blazer that is crafted from the highest quality velvet is sure to be the best on all occasions especially if it is the blue velvet blazer. The blue color offers a sophisticated look and the best thing about this color is that it looks good on all skin tones. Blue is a sober as well as a lively color that can be worn by men of all ages and build. So if you are planning to buy a velvet blazer this season, visit MensUSA and pick up the best quality blue velvet blazer that can be worn for theme parties as well. There are certain shades that have a royal touch and purple is that gorgeous shade that makes one look smart and dignified. The purple velvet blazer is one of the best choice when you wish to look outstanding and different in a gathering. The velvet fabric has a luster that easily attracts everyone around. The purple shade adds to the shiny glow of the purple velvet blazer. The softness and the fabric keeps you comfortable for hours while you roam the party hall showing off your uniqueness and stylish tastes. A blazer is an essential part of a man's suit. So selecting the right color blazer when you are planning to go beyond the regular looks, try the burgundy blazer. It is an amazing color that matches with all lighter shades of dress shirts and trousers. To look smart and establish your own stylish attitude, you must opt for this special shade that makes you stand out from the crowd. The burgundy blazer can be worn for all occasions and time. It is neither too bright nor too dull. Just appropriate to flaunt your sense of style. Visit MensUSA for the best quality burgundy jacket that will offer you comfort as well as style. There are some colors in blazers that have always been the favorites of style-conscious men. 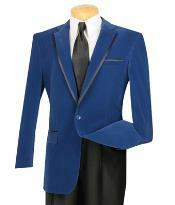 Among them, Men's royal blue blazer stands out as the most popular choice for parties and get-togethers. It is a beautiful shade that look gorgeous when worn as a complete suit or with other matching accessories. The royal feel of the color gives even an ordinary man, an outstanding appearance especially if the cuts and the fit is perfect. 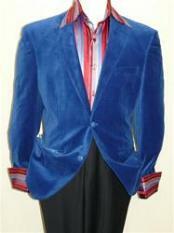 For the best designer Men's royal blue blazer visit MensUSA. You will be glad that you came here. White is a sober as well as a shade that portrays dignity and sophistication. Moreover white blazers for men can be worn for all occasions as they match well with all other shades of trousers and dress shirts. Get the right size and fit from MensUSA to look outstanding and elegant on all occasions and always ready to flaunt your style.